Need to clear all my urgent blog posts first before I can blog about this! And finally! Tonight I managed to squeeze out some time! 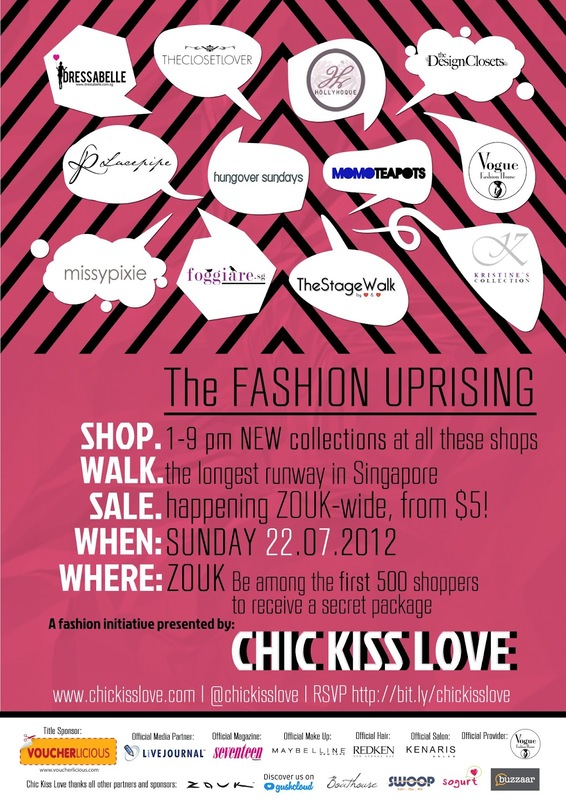 Chic Kiss Love Presents The Fashion Uprising was held on 22 July 12 (Sat) at Zouk! Thanks Melissa of http://melicacy.com for a pair of Golden Tickets for the event! Biggest online labels in Singapore will come together in a fashion showcase like never before. Housed under the alliance called Chic Kiss Love, The Fashion Uprising will formalise the partnership among these 12 labels, which have earned a reputation among Singaporeans since the online shopping boom. The Fashion Uprising will be held at Zouk where the 12 labels will proudly showcase their self-manufactured items and designs, for loyal fans and non-online shoppers alike to touch, try and buy. These 12 labels will take the form of pop up booths complete with changing rooms and mirrors, transforming Zouk into a shopping arena like never before. What’s so special about the Golden Tickets? There will also be runway shows on the event, whereby CHIC KISS LOVE will attempt to break the record of the longest runway in Singapore. foggiare.sg my favourite blogshop of all! Here are all the participating blogshops!